Situated on the town hillock, near the Coromandel Coast, this temple lies in proximity to the Bay of Bengal. Mainly popular as rock-cut caves or mandapas, these temples comprise of bas-reliefs. According to historical artifacts, the construction era of these temples dates back to the reign of the Pallava rulers, around 8th century A.D. The constructional endeavors of these shore temples were the brainchild of the Pallava king Rajasimha. 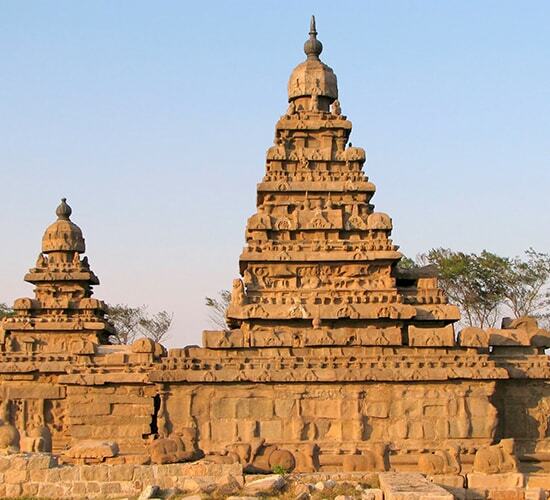 Popularly known as the Seven Pagodas, the shore temples of Mahabalipuram were as many as seven in numbers. But banking on the present day history, only one Mahabalipuram Temple stands tall, withstanding the cruelties of time. The magnanimous edifice stands tall essaying the mythological sagas of Mahabharata. Mainly known as Rathas, these monolithic structures contain five significant Rathas of Arjuna, Dharmaraja, Bhima, Draupadi, and Sahadeva. Not only do these temples portray the sheer architectural excellence of the Pallavas, but also contain a considerable cultural history of that age. Patronizing art to its fullest, these temples are known to host dance performances of various exponents, from all over the country. Paying a visit to the cave temples at Mahabalipuram will provide pilgrims and devotees, the opportunity to offer prayers to multiple deities. Beginning with five Rathas, one can pay their holy tributes to the Dharmaraj, Arjuna, Bhima, Sahadeva and Draupadi Ratha. Moreover, behind the Draupadi and Arjuna edifice lays the sculpture of Nandi. Other than this, there are Shore temples housing two distinguished shrines, faced towards the east and the west. These are the shrines of Lord Vishnu and Lord Shiva. While visiting the Mahabalipuram Temple kancheepuram, pilgrims and devotees are sure to be intrigued by the sculptural beauty of idols. The shore temples houses three shrines. First two shrines is the holy abode of Lord Shiva. The third one, without the presence of Vimanas, houses the idol of Lord Vishnu. Apart from the architectural beauty of the idols, one will come to the royal posture of Lord Vishnu, popularly known as Anantasayana. The serpent couch is his seat, and he bears the title of Stalasayana Perumal. Apart from the Vaishnava and the Shaiva shrines, the Lord Anantasavi image is also present. Moving southwards to the sanctum will reveal the Mahisasurmardini miniature along with a majestic structure of a lion. Again towards the east, one can find the existence of a small gopura. The inner sanctum of the gopura houses a Shiva linga. Other than that, there are panels containing structures of Lord Shiva, Goddess Parvati, and baby Skanda. Worship procedures followed at the temple completely complies with the Vedic rules. There are priests performing Puja rituals with utmost dedication. One of the most important rituals performed at the temple is the Abhisheka or the sacred bath. Other than that, while offering prayers at the temple, pilgrims and devotees can also find the presence of a water chute. Popularly known as pranala, this structure offers perfect drainage for the Abhisheka waters. Apart from the main rituals, dedicated followers of the Lord cannot offer waters to the Linga. It is not prevalent in the temple, and the water offering is not supported. During the month of December, Mahabalipuram records the maximum number of footfall. Commencing from 25th of December, a cultural extravaganza in the form of Mahabalipuram Dance Festival occurs in the region. Unique in nature and form, this is one of the most significant festivals of the state. The Department of Tourism, Tamil Nadu takes a keen interest in organizing the entire event. Those with a religious bent of mind, find this time of the year, appropriate for visiting the temple. Apart from the religious fervor, one can also experience the cultural heritage of the state. Primarily, the dance performance occurs on an open air stage. Moreover, it has great religious significance, as the stage is adjacent to the spot of Arjuna’s penance. Mostly occurring on Saturdays, the celebrations provide an occasion of great joy and ecstasy for the Tamil Nadu inhabitants. Moreover, pilgrims across boundaries flock the temple arena to catch a glimpse of the internationally acclaimed performances of Bharatnatyam, Odissi, and other dance forms. Around the year, thousands of pilgrims gather in the temple to offer prayers. Apart from that, the Mahabalipuram Shore temples bear the relics of the rich architectural heritage of the country. Apart from that, both nationally and internationally acclaimed artists, make it a point to visit the temple, during the month of December. With the lucid and hassle-free transportation facilities of Tamil Nadu, pilgrims and devotees have precious little to panic about their arrival at the temple. Moreover, irrespective of the route taken, visitors can reach the Mahabalipuram Temple tamilnadu sans any inconvenience. In case, you are planning on paying a visit to the temple, get to know transportation availabilities, via all the three modes. By Road: Boasting of great connections with almost the entire state, Mahabalipuram possess some of the best services of the state. Local pilgrims, wishing to catch a glimpse of the exquisite temple can completely rely on the regular bus services. Moreover, for visitors approaching the temple from adjacent areas, the transportation resources aplenty. Pondicherry inhabitants can make most of the bus services operating between the two cities. Visitors from Kanchipuram, Chennai and Chengalpattu, can follow the same route. By Rail: Those wishing to take the rail route can opt for the regular trains, schedule to operate till Mahabalipuram. The nearest railway station to the temple is the Chengalpattu Railway Station, located 29 kilometers from the temple. Outstation pilgrims commencing their journey from Chennai can get down at the Chennai Railway Station, situated at 58 kilometers. By Air: For devotees across boundaries, there exist great options in airways. The air dome in proximity to the temple is the Chennai International Airport, at a distance of 58 kilometers. After offering prayers at the temple, travel enthusiasts must set out to explore the scenic extravaganza of Mahabalipuram. Getting knowledgeable on the Mahabalipuram Temple timing will be advantageous, in this regard. Visitors can schedule their tour plans accordingly and travel to the most enthralling destinations of the region. Sri Ramanathaswamy Temple: Being one of the sacred Char Dhams, this temple is the sacred residence of Lord Shiva. The manifestation of the Lord, in this temple, is in the form a lingam. Situated at Rameshwaram, the temple boasts of the magnificent Gopurams. Shrine of Goddess Vishalakshi is also present in the temple complex. Sri Rangam Ranga Nathar Temple: Considered amongst the most illustrious temples of the country, this particular temple houses Lord Rangnatha; the holy manifestation of Lord Vishnu. Several water bodies present at the site of the temple occupy almost 156 acres of area. Moreover, the temple bears the relics of Vaishnava spirituality and hence, the shrine of Ranganayaki is also present. Rock Fort Temple: With a location in Tiruchirapalli, this temple dates is almost 3.8 billion years old. Constructed by the Chola rulers, the construction of the temple began around 600 CE. Housing almost three temples within its complex, the temple worships several deities. Ekambareswarar Temple: By far, Kanchipuram’s largest temple is the Ekambareswarar Temple. Popular as one of the Panchabhoota Sthalams, this temple is the sacred home of Lord Shiva. While visiting the temple, one will surely wish to catch glimpses of the Mahabalipuram Temple history. The historical event of Arjuna’s penance is one of the noted accounts of ancient history. According to the popular historical artifacts and religious beliefs, the temple edifice is the storehouse of exclusive historical accounts of the Mahabharata. Visiting the temple provides pilgrims and devotees, throughout the country, deeper insights into the historical significance of the Pallava era. Moreover, the Arjuna Ratha essays the story of Arjuna’s meticulous penance and other significant illustrations from the Mahabharata. According to popular Mahabalipuram Temple puja history accounts, prevalent in the region, this is the spot, where Arjuna practiced rigorous penance. He wished to seek the blessings of Lord Shiva. Moreover, to attain an unprecedented victory of his enemies, Arjuna prayed for the weapon of Lord Shiva. Deeply moved by his rigorous penance and utmost dedication, Lord Shiva showered blessings on this great warrior. Additionally, he granted his wish and presented him with a special weapon, used only by the Lord. After receiving the gracious glory of the Lord, there was no stopping Arjuna’s victory. Another notable legend associated with the temple establishes the sacred saga of River Ganga’s emergence to earth. The Mahabalipuram Temple photo depicts the instance of Bhagiratha practicing rigorous penance, to bring River Ganga to Earth. Prior to his penance, the heaven was the holy abode of River Ganga. According to other historical accounts, the temple exhibits some unique sculptures. These sculptures offer pilgrims, devotees and tourists with a deeper insight into the tales of Panchatantra.